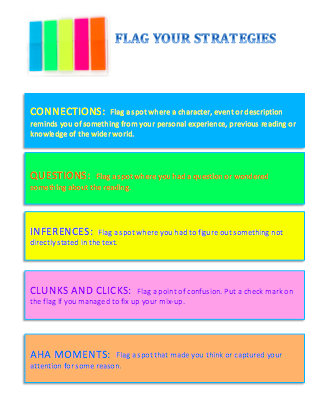 Printable pdf: FLAG YOUR STRATEGIES. What? Choose several comprehension strategies to be reinforced. (The image on the left includes Connecting, Questioning, Inferring, Monitoring and “Aha!”). Provide each student with a collection of colored sticky tabs or flags. Have them read a short section of text and flag at least two spots where they used specific strategies. Why? Flagging strategy spots encourages readers to be metacognitive about the strategies they are using as they read. When readers are aware of the strategies they have in their “toolkits,” they will be better able to apply those strategies when the reading gets tough. Invite students to tab 2-3 strategies in a short section of text. Be sure to provide opportunities for students to discuss with others the strategy spots they flagged and what their thinking was. If there’s not an opportunity for immediate discussion, have students transfer their flags to paper and record the page numbers and what they were thinking. Have students remove their sticky notes and transfer them to a large piece of chart paper. Together, analyze which strategies were used most frequently and why that might be. Use sticky note reading discriminately and for deliberate purposes. Too much notation can actually interfere with comprehension and engagement with the text. Work with short passages of text at a time. Don’t ask students to use all five strategies. We use different strategies at different times, depending on the nature of the text and our background knowledge. Sometimes we’ll use the same strategy over and over. However, color-coding and analyzing the strategies can help students identify which strategies they might need to practice more. Students should be expected to explain their thinking. Be sure to allow time for discussion or written opportunities for students to articulate their thinking. Remember that flagging strategies is a means to an end, not an end in itself. The ultimate goal is for students to apply the strategies independently.